Some people consider there to be two kinds of self-doubt: the helpful and the harmful. Patrick Carroll, an assistant professor of psychology at Ohio State University, has studied the effects of self-doubt. He said there is a significant difference between what he calls “idea doubt”—doubting that one’s creative work isn’t quite up to standards—and more general self-doubt, or a fundamental belief that you are not a worthy individual. He believes that idea doubt is a part of the creative process. 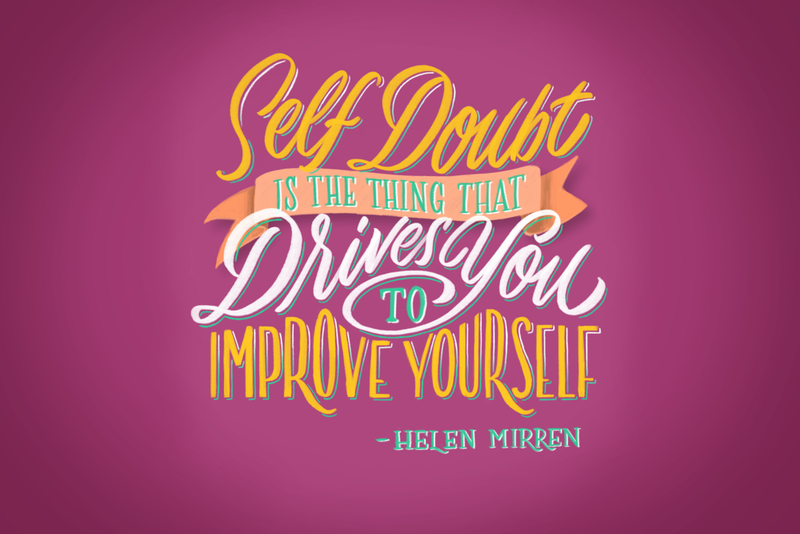 I think that when people like Helen Mirren are talking about the “good kind” of self-doubt, they are really talking about self-analysis. Self-critique elevates and transforms your ideas by helping to make small changes. Lettering artists especially have an active critique muscle, even when nobody else notices the problems. We need to see what’s wrong in order to fix it. In any creative process, whether it's writing, lettering, or painting, every idea needs to start as a rough draft and then get tweaked. Self-critique is necessary for this process. Creative professionals face debilitating self-doubt more often than the average Joe. This is because we rely on our creative analysis process for our livelihood. When an artist is already prone to chronic self-doubt and insecurity, it can easily be exacerbated by the creative process. And, just like that, we are stuck, unable to create anything at all. Those who do their jobs by the manual are less likely to feel this self-doubt; the directions are clear and in front of them. When I was an office manager, I didn’t feel nearly as much existential self-doubt throughout the day. On top of that challenge, artists are constantly bombarded by people trying to bring their prices down, undervaluing creative work, and giving client critiques that are less than confidence-boosting. So what do we do when we can’t even trust motivational quotes, articles, or books to inspire us? Use the same critiquing muscle that you use towards yourself, and direct it towards what you consume. Don’t swallow everything whole; take inspirational quotes with a grain of salt. So many people are misusing words all over the place that the same word can mean something completely different to another person. I need a lot of motivation to keep going with my creative business. I have come to trust certain voices such as my favorite podcast hosts, teachers, bloggers, and authors. This helps me make sense of the barrage of mixed messages I receive each day. And when I’m looking for new ones, I take what works for me and leave what doesn’t to the curbside of the internet junkyard. There is a lot to sift through out there. So we need to be on our toes to find what is truly helpful for us, and what is not. This more discerning filter has proven to be a hugely valuable tool on my path to becoming a professional artist. If I had internalized every quote and piece of advice out there, I would have quit by now. P.S. If you like the quote the old way, here it is.